Latest photo available of the OICW (being fired,) and it appears from the shell casing that this is a working version, at least for target practice or promotional photos. The next generation on the battlefield is here. 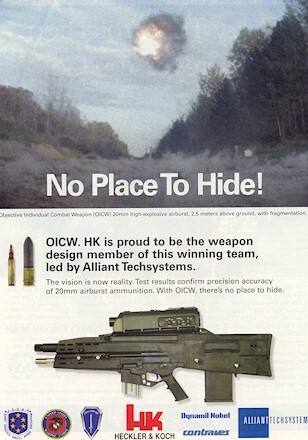 It is called the OICW, or Objective Individual Combat Weapon, and HK is right there on the cutting edge with the development of the actual weapons platform that will perhaps take U.S and NATO soldiers into the next Century. 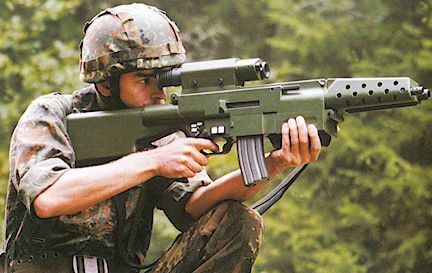 Very basically, the U.S. military wanted a weapon system that mates a conventional rifle with a 20mm "cannon" that is capable of delivering a special munition that can be user set to explode with an airburst at user determined and programmable ranges. 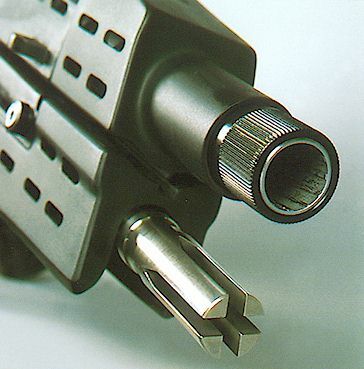 What looks like an M16 underneath should give you pause to look closer. 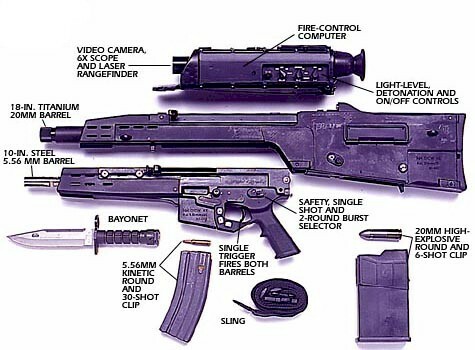 It is a variant of the HK G36K, with an M16 magazine adapter! 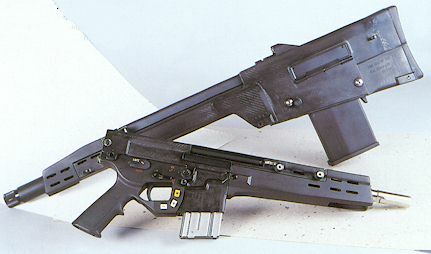 This is something that HK promises for the conventional G36 series as well. The selector switch and the flash hider are the G36K variant giveaway. 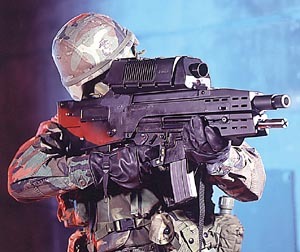 Proof once again that when the military needs something on the cutting edge, HK is the logical choice. 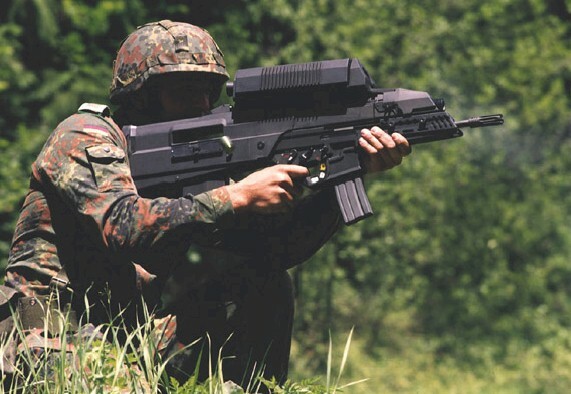 A bargain price for the military? $10,000 to $12,000 each, and $25-$30 a pop for the 20mm ammunition. 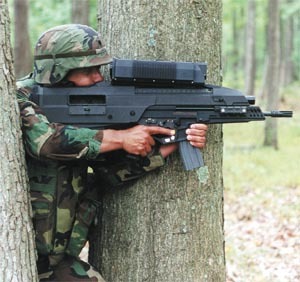 The military plans an initial order of 45,000 units, and for them to be fielded with special units by 2009. The U.S. Military has given the OICW the designation M29. 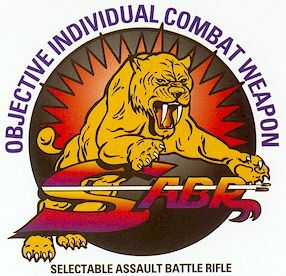 First concept model of the OICW, February, 1994. 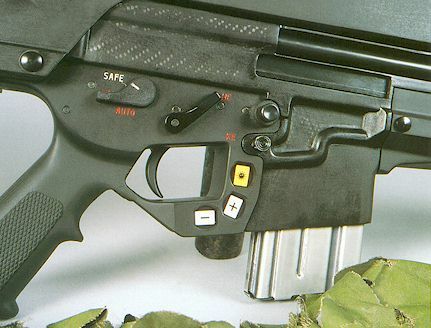 February, 1996: The first firing model of the OICW. 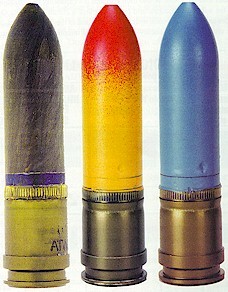 Three different 20mm ammunition types for the OICW. From Left to Right: Bursting munition, High Explosive, Target Practice. 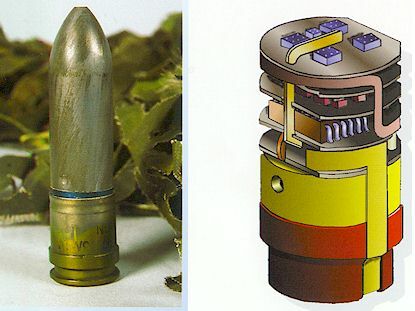 High Explosive 20mm round with illustration of the internal circuitry necessary for distance programmable detonation.